The BL-3500SLX is the ultimate small car and track portable lift. This is the portable car lift that started them all. Super lightweight, easy to roll or even carry, this unit is ideal for small-wheelbase cars in the garage or taken out for track day. QuickJack offers an easy solution to get more work done quickly. And if speed and ease-of-use aren't reasons enough to dump your old floor jack and stands, QuickJack is extremely safe and stable on almost any surface type. That's why racers and DIY'ers have been ecstatic about QuickJack since day one of its release. 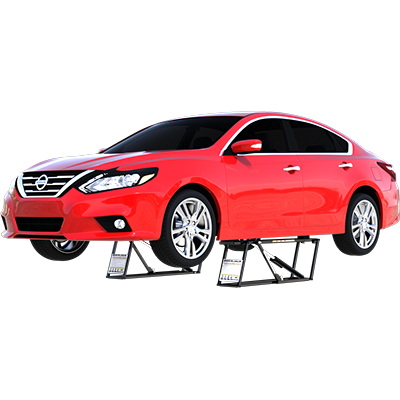 If you have a small vehicle and love to wrench, the BL-3500SLX is the only car ​lift replacement for jacks and stands you'll ever need. Engineered for durability and longevity, this model is made from the same 14-gauge steel as QuickJack's heavier-duty models. Its ​1,588-kg. lifting capacity is more than enough for many small sedans and race cars, and it fits neatly in most trunks and backseats. Without a doubt, this is the most user-friendly and portable lift ever made. A super-low ​76 mm profile makes it easy to glide the frames under low-stance cars. One look at QuickJack and you'll never have to think twice about setting up your next wheel swap, sliding underneath for an oil change, safely tuning your suspension, etc. Racers have found QuickJack indispensable because those hard-to-predict issues that occur when you're pushing your car to the limit require time to fix. And with QuickJack, that time is reduced to minutes instead of hours. The BL-3500SLX is made especially for racers and drivers of small-wheelbase vehicles, on or off the track. Choose optional 12V DC power for even more portability. QuickJack has no cross members, no clumsy lifting chains and no mechanical gears to wear out over time. Enjoy simple, easy, pure electric-hydraulic power and two lock positions that are more than enough to guarantee your safety at all times.